25 Years of Making Music Together! The interPLAY Orchestra rehearses and performs year-round at The Music Center at Strathmore. Rehearsals are held at the Strathmore Education Center, 4th floor. Walk in the front door of Strathmore and the education center is on the right. Straight to the back are elevators. Since you are on the third floor, you will go up one floor. Rehearsals are Monday evenings from 6:30 p.m. to 8:00 p.m.
Concerts begin at 8:00 p.m. and are held at The Music Center at Strathmore. Concerts are not appropriate for children under twelve years of age. If you have questions, please call Ken Silverstein, Managing Director, at (301) 570-6664. For concerts at The Music Center at Strathmore, we have riser seating for performances. Other seating is available. In order to accommodate special needs, please notify us before a concert at (301) 570-6664. 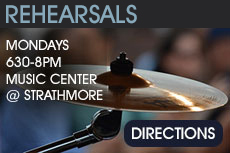 The Music Center at Strathmore has an excellent directions page; click here. Scroll to the bottom of that page for driving directions. Parking is located in the Grosvenor-Strathmore Metro Garage for a fee of $5.50 Monday-Friday. This is paid using a Metro SmarTrip card, or by a major credit card at the single exit lane so indicated. SmarTrip card dispensers are available at all stations with Metro-operated parking lots. The dispensers sell SmarTrip cards for $10 — $5 for the card itself and $5 in fare value. The dispenser accepts only $1, $5 and $10 bills. Limited short-term parking also is available at specially marked meters along Tuckerman Lane. Currently, parking on weekends in the Metro garage is free. To access the Music Center from the Grosvenor-Strathmore Metro garage (4th floor), walk across the glass-enclosed sky bridge. Metro is doing away with all on-site human attendants that had been on duty from 10 a.m. to midnight weekdays. The interPLAY Orchestra practices and performs Monday evenings and is therefore impacted by this change. You can interact by intercom (and video camera connection) with Metro staff through in-lane customer service stations located as you exit the Metro. Also, each exit lane will have a credit card and Smartrip Card reader. The Grosvenor-Strathmore station in-lane Customer Service Stations will connect you with Metro Parking Operations Control Center (POCC). The parking barrier gates are opened and closed remotely from the POCC, and you can interact live with POCC office staff through the in-lane customer service stations. Copyright © The interPLAY Orchestra. All rights reserved.